Candidates from left to right: Chris King, Andrew Gillum, Gwen Graham, Jeff Greene, Philip Levine, Ron DeSantis and Adam Putnam. Early voting is underway across Florida right now as candidates for governor barnstorm the state hoping to get that final edge in the polls. It’s a tight race between the Democrats, although Gwen Graham is holding the lead and on the Republican side, Ron DeSantis is pulling away from Agriculture Commissioner Adam Putnam. So what’s the state of play with just a few more days to go until Tuesday’s primary? We welcomed Marc Caputo, Reporter for POLITICO Florida and S.V. Date, Senior Reporter with the Huffington Post with their thoughts on how Florida’s primary election is shaping up. 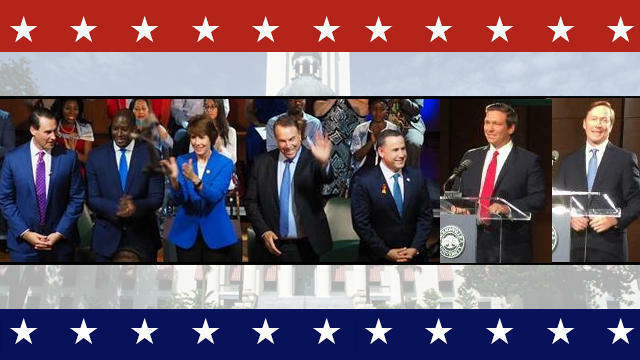 The general election to succeed Florida Gov. Rick Scott will be one of the nation’s most important in an increasingly conservative swing state. Election forecasters rate it a toss-up. “The election is going to be about Donald Trump, which is not very original,” said Mac Stipanovich, a longtime Republican operative who offered his assessments of DeSantis and Graham. Floridians are persistently and evenly split on the president. With Florida’s congressional redistricting coming up in 2020 the new governor elected this year will have veto power. The reverberations of the 2018 election could be felt in Washington for the next decade and longer. Florida is also one of the states that refused under GOP control to expand Medicaid under Obamacare, leaving hundreds of thousands of its poorest citizens without health coverage, an issue that is a clear dividing line between the Democratic and Republican candidates in the governor’s campaign. The anticipated general election match-up is an establishment Democrat and a Trump-backed candidate, a dynamic found in many of 2018’s most important midterm elections. It’s gonna be close. DeSantis has been in the US House since 2012. He’s had his eyes on higher office for a while. He originally planned to run for Sen. Marco Rubio’s seat in 2016 before the senator decided to reclaim his old spot after dropping out of the presidential campaign. DeSantis voted for the GOP tax law and Obamacare repeal in the House last year. FiveThirtyEight estimates that he has voted with Trump 94 percent of the time. The congressman has shamelessly sought Trump’s approval. One of his first campaign commercials showed him and his daughter building a model of the president’s wall and ended with his young son in a “Make America Great Again” onesie. DeSantis called Trump and asked for his endorsement. But Trump is still popular with the Republican base, of course, which has put Putnam, DeSantis’ most credible challenger and a former congressman himself, in a bit of a bind. “It’s hard to be too far to the right,” Stipanovich said of the primary electorate. Putnam is undoubtedly the establishment choice: While DeSantis has Trump and Sean Hannity, Putnam has the state chamber of commerce as well as several Republican leaders in the Florida Legislature. The polling shows a race too close: DeSantis leads Putnam by 5.2 points on average, according to Real Clear Politics but the most recent surveys show a one- or two-point outcome. Gwen Graham, who served one term in the House for Florida’s second congressional district, has held a steady lead in the Democratic primary polling: Real Clear Politics puts her average lead at nearly eight points. It would be a bit of a shock if she is not the Democratic gubernatorial nominee after Tuesday’s primary election. Graham is positioning herself as a check on Florida’s Republican-controlled legislature — which has been that way for years — and emphasizing her family’s history in the state. Her father, Bob Graham, was Florida’s governor and a United States senator for nearly 30 years. She has attracted the most endorsements, getting a nod from Sen. Kirsten Gillibrand (D-NY) and House Democratic Whip Steny Hoyer, among many others. Three men — and, remember, Democratic women have performed very well in primaries where their competitors are men — are trailing a little behind Graham. Tallahassee Mayor Andrew Gillum is trying to energize the left, receiving support from Bernie Sanders and Tom Steyer’s NextGen group while endorsing single-payer health care. Stipanovich described Graham as “a center-left Democrat, not a left-wing headbanger.” She has, for example, declined to endorse a single-payer health care plan. That has led to the concern, he said, that Graham “won’t motivate the base” in the general election. But that’s where a Trump-lite opponent like DeSantis could come in handy. Trump is nothing if not divisive: Polling has shown that Florida has generally felt more warmly toward the president than some other swing states. However, a recent Florida Atlantic University survey found his job approval to still be just 43 percent, versus 45 percent disapproval. As in many other places, suburban white women could be crucial, and “Gwen being a suburban white woman certainly helps,” Schale said. “I find it hard to believe if DeSantis is the nominee, the left will stay home,” Stipanovich said. But the Florida governor’s race has earned its toss-up status. The polls show Graham leading DeSantis by three or four points, but trailing Putnam (if he were to top DeSantis in the Republican primary) by one or two points. Trump won here by a single percentage point. Florida loves to keep us guessing. Copyright 2018 WJCT 89.9 FM Jacksonville. To see more, visit WJCT 89.9 FM Jacksonville.